Green senior Tayte Carver allowed just one hit in the Bobcats 11-0 win over Notre Dame Friday night. Green senior Bryce Ponn stands beside head coach Danny McDavid after his bases clearing three RBI triple in the Bobcats win over Notre Dame Friday night. 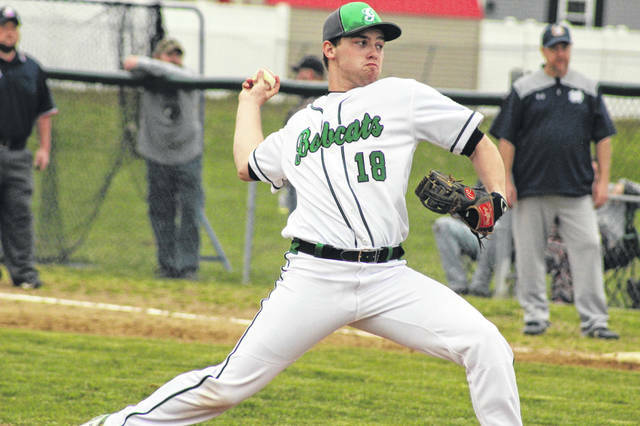 FRANKLIN FURNACE – Green baseball program’s business like mentality is a main reason why they’ve won back to back SOC I titles, and it’s a big reason why the Bobcats are on a six game winning streak with a 7-1 record to start the 2019 season following their 11-0 win over conference rival Notre Dame Friday night. Senior pitcher Tayte Carver retired the first thirteen batters in Friday night’s five inning contest, but that might be an understatement for just how dominant Carver was in those 4 1/3 innings of work. By game’s end, Carver finished with ten strikeouts, one batter walked (Titans sophomore Caleb Nichols), and one hit allowed to third baseman Chris Schmidt with one out in the top of the fifth. In fact, Schmidt’s single was the only ball hit to an outfielder through the Titans opportunities at the plate Friday night. And if Caver’s pitching performance stood out, the Bobcats bats were just as impressive in their shutout win. Two runs scored in the bottom of the first, four scored in the bottom of the second, and five scored in the bottom of the third helped Green tally a total of eleven runs in their home conference win. Friday’s biggest performances at the plate came from two guys that have been red hot to start 2019: Bryce Ponn and Tanner Kimbler. Ponn finished Friday 2/2 at the plate with a game high four RBI, three of which came off a three-RBI triple in the bottom of the second while Kimbler finished 2/2 with two RBI, each of which came in his final two plate appearances. The best thing for Green to do moving forward to continue their hot streak according to McDavid and Carver? More of the same while keeping to their routines of what’s gotten them to this point of success thus far. Green and Notre Dame will prepare for game two of their season series on Monday in Portsmouth. https://www.portsmouth-dailytimes.com/wp-content/uploads/sites/28/2019/04/web1_IMG_5015.jpgGreen senior Tayte Carver allowed just one hit in the Bobcats 11-0 win over Notre Dame Friday night. 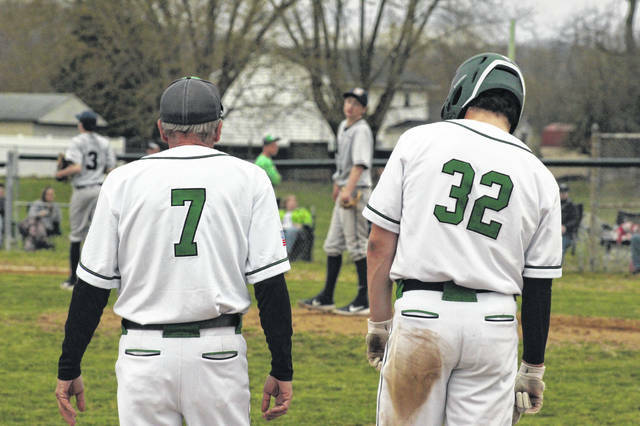 Green senior Bryce Ponn stands beside head coach Danny McDavid after his bases clearing three RBI triple in the Bobcats win over Notre Dame Friday night.